Here at TMP we know how challenging it is for you, when your business expects more. More hires, increased diversity, better quality and in less time. We’re a talent solutions business and we want to help you solve your talent challenges. This autumn we want to give your talent/resourcing team some practical tips on how to effect change in your current model. Our interactive and engaging SMART HOUR series is going to get under the skin of the problems organisations face, analysing some of the symptoms and discussing ideas and tools that you can apply to your talent challenges. 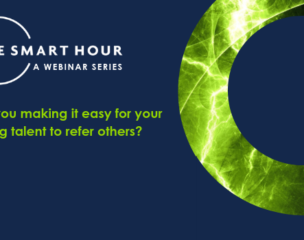 On Tuesday 30th October at 2pm, our webinar looked at how to build a winning employee referral programme, which is the preferred recruiting channel for 85% of top organisations. The business case for Employee Referral Programmes is clear. Lower cost per hire, enhanced retention and higher productivity are just some of the benefits. But do you have a high profile programme that continues to deliver results? Sign up below and ask yourself, are you making it easy for young talent to refer others?